Celler De l'Encastell Marge 2006, an impressive 92-point Priorat blend of Garnacha, Syrah, Merlot, and Cabernet Sauvignon, it is smooth, concentrated, and built to last. Just $24.99 a bottle on sale at Wine Library ... Log on to place your order today! When hard times come knocking on the door, what in the heck are we going to do about a necessary luxury like wine?  Cellier des Dauphins 2005 "Prestige" Cotes du Rhone ($10.99) An affordable treat, good for sipping as a glass of red wine, but so food-friendly that it would be a shame not to enjoy it with beef, poultry or cheese. Your 401(k) is a mere shadow of its former self. Your house is now officially worth less than you still owe on it, and so is your car. And you're not absolutely certain that when you go down to your bank in the morning, you won't find that someone has put a padlock on the door. For purposes of this discussion, let's assume that our economic straits aren't so dire that we'll be forced to give up wine entirely or even to drinking anonymous wines in jug or box. But even slightly desperate times call for serious measures, so today let's take look at a few strategies that may help keep a fine-wine hobby comfortably fed even when we're watching our wallets more closely than ever. To me the approach seems obvious: In our strategy as wine consumers for the duration, buy affordably but buy smart. This counsel may seem similar to the stock market wisdom, "Buy low, sell high" as advice that's easy to give but difficult to work out in the real world. But not so fast! Here are a few specific tips that may help.  Keep an eye out for sales. Many wine shops, including our friends at Wine Library in New Jersey (see sponsor information below), are famous for offering special wines at marked-down prices, and advertise these sales widely in local media and online.  Try for a discount. In most states where the laws allow, you can qualify for a discount if you buy a 12-bottle case, and many shops will extend this discount for a "mixed" case of different bottles. Some shops discount for six bottles or even extend a discount to regular customers buying less. Sometimes buying more costs less, and by stocking your home wine rack, you can save a pre-dinner trip to the store.  Mine the in-store specials. Wine shops typically offer special deals in displays at the end of display rows or in separate boxes and baskets. These markdowns may occur for a variety of reasons, but most often reflect either a large buy at a low price or, possibly, the merchant's desire to get rid of an oversupply of older stock. Use common sense here - Tired 2-year-old Beaujolais Nouveau isn't much of a deal - but choose trustworthy merchants and you won't have to fear being taken advantage of.  Speaking of trustworthy wine shops ... Whether you're new to wine or an old pro, it's hard to have a better friend in your quest for value than the kind of wine-shop proprietor who loves wine, knows wine, and understands that the best way to build long-term customer loyalty is to offer sound, honest advice even when the result is a low-end sale. Once you've established a good relationship with a trusted merchant, you can feel comfortable about asking for a good, cheap wine and not being sent home with a bottle of turpentine.  Finally, drink better but less. If the quest for quality $10 wines simple doesn't work for you but you still need to save, consider this strategy: Limit your fine-wine enjoyment to special nights - and that might simply mean Saturday night - and spend a little more for one weekly bottle than you might have previously paid down for three or four bottles per week. and would be delighted to see you post your comments as responses. Forum discussions are open for public viewing, but you must register to post. Registration is free and easy; we ask only that you join following our Real Names Real Format system, using your real name in the format "John Doe" or "John D". For today's tasting report, which you'll find below, we focus on a very attractive French wine in the $10 range. 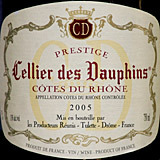 Cellier des Dauphins 2005 "Prestige" Cotes du Rhone, a typical Southern Rhone blend of Grenache, Carignan, Syrah and Cinsault grapes. One highly rated wine you may have missed: Celler De l'Encastell Marge 2006, an impressive Priorat that earned a 92-point review from Jay Miller of Robert Parker's The Wine Advocate. A blend of Garnacha, Syrah, Merlot, and Cabernet Sauvignon, it is smooth, concentrated, and built to last. Just $24.99 at Wine Library, the Marge is a terrific window into the premium wines of Spain! Log on to place your order today ... Click here for details! FOOD MATCH: Good with red meat or poultry; its snappy fruit flavors made a great match with a Franco-Italian creation, lamb meatballs simmered in a little beef broth with fresh tomatoes and herbs and served over conchiglie pasta. VALUE: Very good value at the $10 price point, a neighborhood that's becoming increasingly attractive in rough economic times. WHEN TO DRINK: Simple Cotes du Rhone is best enjoyed young and fresh, although this wine isn't likely to lose its fruit over the next couple of years, assuming reasonably good storage. Then select "product range" and then work down to "Cotes du Rhone" to find a short fact sheet on today's wine.